Delaware’s multifaceted offense was everything it was advertised to be. Inside, outside – it didn’t matter. They kept fighting and they were not going down quietly. The Fightin’ Blue Hens persisted onward and hung for dear life, but ultimately fell to the Wildcats. Delaware came ready for the 3/4 press that was so instrumental in winning against both Mount St. Mary’s and Towson. They were careful with the ball, and didn’t crumble like teams in the past that came to play in the Pavilion this season. Villanova only forced 12 turnovers, a number far lower from what they were able to do in the past few games. With both teams grinding out, the lead changed hands 11 times. Villanova’s offense was flowing through JayVaughn Pinkston who led the team in scoring with 26 points. He also added 5 rebounds and 3 assists. He showed great finishing ability from inside the paint and got the job done from the free throw line. Villanova took a 43-40 lead into the half. Delaware picked things up from right where they left it, and continued to put up a fight. The back and forth nature continued throughout the second half. The Wildcats had a hard time establishing a rhythm and getting things going. Fouls (some questionable) and cold shooting led to frustration for Villanova. Delaware was more accurate in their shooting, going 45.5% vs. Villanova’s 43.9%. The shooting disparity was especially felt from three point range. The Wildcats’ woes from long range continued as they went 5 for 25 (20%). On the other hand, Delaware shot rather well, going 11 for 26 (42.3%). Davon Usher was 5 for 10 when shooting threes, and Kyle Anderson was 4 for 9. They seemed unstoppable, just when Villanova seemed that they were pulling away; they would answer back. Usher hit a three-pointer with 3:02 left to tie the game at 76. From there JayVaughn Pinkston would instigate a 7-0 run that would finally put the Fightin’ Blue Hens away. Pinkston’s three point play put the Wildcats ahead and they never lost the lead again. Four starters on each side reached double digits scoring. Pinkston led the Wildcats with 26. James Bell had 16 points and 7 rebounds. Darrun Hilliard added a solid 15 points, 9 rebounds and 6 assists. Ryan Arcidiacono struggled from behind the arc, shooting only 1 for 8, but still contributed 14 points. Daniel Ochefu would only have 6 points, but had 11 rebounds. 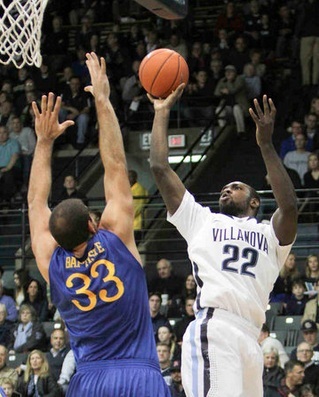 Ochefu’s 11 rebounds was a large help for Villanova, as they outrebounded Delaware 45-32. One of the keys for the Wildcats to win was to win the rebounding battle and limit second chance points. For Delaware, they proved that they could play well without star Devon Saddler, who is currently undergoing a one month suspension. Davon Usher had a game high 27 points. Kyle Anderson shot well from behind the arc and finished with 17 points. Jarvis Threatt and Carl Baptiste would add 17 and 13 points, respectively. Villanova will be packing their bags and flying to the Bahamas for some Thanksgiving festivities and the Battle 4 Atlantis tournament. Tip-off is at 1 p.m. against USC.